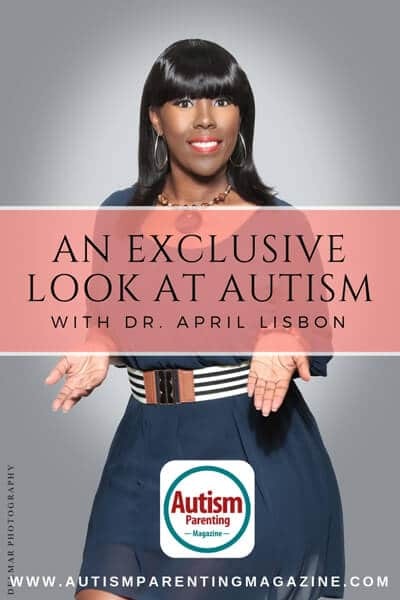 Today’s AUTISM Interview is with April J. Lisbon, EdD who was born in New York but raised on the beautiful island of St. Croix, United States Virgin Islands. Dr. Lisbon has worked tirelessly to advocate for the needs of children. Her passion for children began when she was a teenager working at a local orphanage, which then led to her initial journey as an educator at The Florida State University. Dr. Lisbon is an active public education school psychologist and mentor to new teachers. Over her 18-year tenure as a school psychologist and parent, Dr. Lisbon has learned that it is challenging raising children with exceptional needs. With limited school and community resources, many parents often feel like they are fighting an uphill battle with no end in sight. This, in turn, leads to unwarranted frustration, fatigue, depression, anxiety, and eventually burn out. Dr. Lisbon actively seeks to break the “super parent” stigma as parents of children with exceptional needs try to ‘prove’ to neurotypical parents that their children are just as creative and gifted as children who do not have disabilities. It is out of her passion for families that Dr. Lisbon has embarked on a journey to help families and caregivers relieve fears associated with caring for children with exceptional needs. Dr. April J. Lisbon is a family coach and empowerment speaker who helps motivate and equip families of children with exceptional needs with knowledge on how to purposefully develop and practice self-care skills while passionately living a healthier lifestyle in their careers, relationships, and health/wellness. She has authored two books, Stretched Thin: Finding Balance Working and Parenting Children with Special Needs and Autism in April: A Mother’s Journey During the Tween Years. Each book is a reflection of her own experiences raising a child with exceptional needs. Most recently, Dr. Lisbon launched The Burnout Project especially designed for moms raising children with exceptional needs. The first phase of the launch is an eight-week Mastermind group where moms learn to recognize the signs of burnout, own their emotions and feelings through the cycle of burnout, and then move on a path where they are finally able to relax, feel revived, and be re-energized. As Dr. Lisbon continuously reminds herself, self-care is the best care. On her life’s journey, Dr. Lisbon recognizes that the experiences and gifts she possesses do not belong to her. She understands that her blessings are a direct connection to the Most-High/Divine/Universe. Dr. Lisbon’s vision is to one day inspire one million families to discover that not only do they have the power to make a difference in their children’s lives but other families raising children with exceptional needs. I became aware that something was different with my son around age two. He was nonverbal, and he engaged in a lot of focal stimming behaviors. Our family was also in a unique position as I had professional experience working with children with ASD so I was able to recognize some of the signs even when I didn’t want to embrace the idea that ASD may have been an area of concern for my child. The reality during that period of time in our lives and everything else about his growth and development occurred at a typical rate except for my child’s inability to verbalize his wants/needs. My son was not the classic textbook case that I’d learned during my educational training, so even I was unsure if it was possible. This is a very loaded question as I think things have evolved over the years from the first time I became aware that something was different until now. In the present moment, I think what has been most unique about this experience for the both of us has been trying to embrace and find acceptance in my son being diagnosed with ASD. There were times when I’d questioned if my son was on the spectrum because even as he grew from childhood to his tween years, he seemed like your average neurotypical child. It was only when he seemed ‘confused’ by words spoken or stimmed for no apparent reason that I ‘knew’ he was still on the spectrum. There have been times, within the last year, that my son has refused to identify as being autistic because he so desperately wants to be like the other kids in school. There have been times he’s shared that he hates being autistic because he doesn’t like feeling angry all the time. Even with encouragement, there are times when I feel helpless as I’m still learning how to align my body language, voice inflections, and words spoken so that they come from a place of support and not accusatory. I’m also learning how to differentiate (which is challenging) those behaviors/attitudes/choices that are consistent with autism and those that are typical of the tween years. For our particular case, my son has always had the necessary tools to help him be successful IF it were covered by insurance. However, there were some services that were not covered that my son may have benefitted from during his earlier years that were not available. The cost of therapy for a child on the spectrum coupled with a lack of therapists in the area make it challenging for parents, like myself, to find these tools. My children inspire me to be present at all times and live each moment with joy and happiness. Specifically, my ASD son has shown me that even in the face of adversity, there is still room to smile and enjoy life even when people are cruel to you. He has also taught me that it’s okay (he has been wearing bow ties since 4th grade) to feel beautiful in the skin you’re in. In essence, there is confidence in being different from others when you own it. I struggle with practicing self-care regularly as raising a child with ASD is very stressful and leads to burn out easily. I’m always on edge as I am unsure if this will be the day that he may hurt another student or another student will bully him. My inability to protect my son from the painful nuisances often associated with autism at times makes me feel like I am a bad parent. Not having respite care because we are on a waiting list for spaces to open up doesn’t help. What I really need is time for myself where I can breathe and relax. The first key is to never blame yourself. This is easier said than done as your child gets older and the behaviors increase. You have done the best that you can do so applaud yourself. The second key is to intentionally set time in your day to honor who YOU are on this journey. Honor the fact that YOU are equipped to handle this autism journey and your child or children selected the best fit parent(s) to help them along the way. Third, ask for help. One of the toughest challenges that I have experienced is not asking for help for fear that others will not be able to handle working with my son. However, by setting up realistic expectations with your child and the person who will assist you, your child will be okay. Finally, breathe. As a parent raising a child with autism, any and everything will create unrealistic worry or sadness if you don’t take hold of it. Take 10 slow deep breaths, counting from 10-1 so that you have greater clarity.